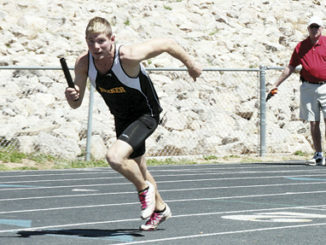 MEEKER I One of Meeker’s track stars returned from injury to compete in the annual Frank Woodburn Invitational, another was injured in the same meet and another is expected back this week, when the Cowboys run, jump and throw at Coal Ridge on Friday and in Glenwood Springs on Saturday. Ahrens teamed up with Linda Olivas, Peyton Burke and Madi Russell to finish in fourth place at the meet held at Stocker Stadium in Grand Junction, with 20 teams representing all classifications. Julia Eskelson, Jamie McLaughlin, Sierra Williams and Maggie Phelan finished third in the 4×800 relay and the 4×200 relay, featuring Williams, Olivas, Russell and Avery Watt placed fifth. Coach Strate also mentioned Sarah Gerloff’s personal best in the shot, with a put of 24-1. Coach Strate said Jacob Henderson ran a personal best (17.43), in the 110-meter hurdles and Noah Overton also had a personal best in the discus throw, (115-7). “Marshall Pool tied his personal best (5:04) in the 1600-meter run, then he ran the 3200 in 11:35 and placed ninth,” Strate said. “We are excited to have Halle in a few more events this weekend and we hope to be able to see Austin Russell return to action after a back injury,” Strate said. 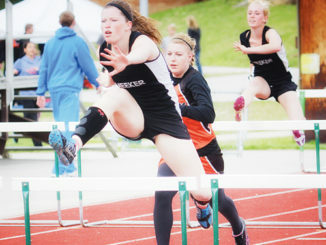 MEEKER I The Meeker High School girls’ track team dominated the Panther Invitational track Meeker in Rangely with 197.5 points and the Meeker boys’ team finished second behind the host team.